"Ursula was active in the RIHS for many years," the organization said. "She was a writer and editor of our book Images of America-Roosevelt Island in 2003 and the author of the text for our maps of the Island. Quietly, Ursula was a perfectionist and great contributor to our efforts. 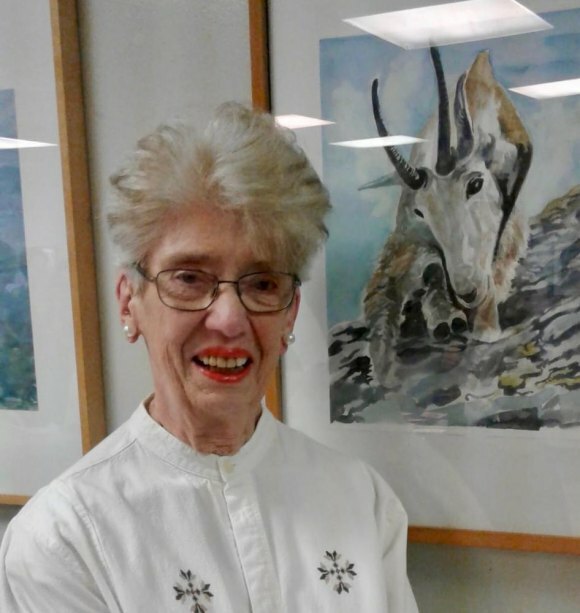 RIHS Treasurer and important contributor to their programs and efforts, "She would gladly sit at our table at community events and discuss the Society with visitors," observed Island historian Judith Berdy. "Ursula worked for over 25 years at Goldwater Memorial Hospital as the Librarian in the Patient’s Library. She ran writing, poetry, arts and many other programs for the residents there. Her knowledge of the patrons of the library was great and she went out of her way to accommodate their wishes. "As Goldwater closed, she transferred to the Coler campus. She reactivated a dormant library into a warm welcoming place for reading, watching videos, using the assistance devices. "She enjoyed the art classes at the Carter Burden Senior Center and showed us her talents in painting." In the photo above, she poses with a painting she completed in the class. Ursula is survived by her brother Dennis Kehoe and family, in California.